It was a treat to both collectors and connoisseurs. The 11th edition of India Art Fair featuring over 75 galleries presented a mix palate of memories—some sepia-toned, infused with warmth and happiness, while others grey, bitter and brittle. Giving them a form, texture or a voice, new art projects includes ‘Change Room’ by Baaraan Ijlal and presented by Prameya Art Foundation and ‘Postcards from Home’ by Manisha Gera Baswani, presented by Gallery Espace. As one walks through, one is greeted with bags of sacks of wheat, with 47 postcards, featuring 25 Indian and 22 Pakistani artists who have had a history with Partition, photographed in their creative spaces over the time by Baswani. The cards feature an anecdote or even a conversation that rekindles the thought of the ‘home lost but not forgotten’. Krishen Khanna’s memories of fellow artist and friend, Bal Chhabda, where he writes about how the latter came to Ahmedabad, post Partition with his brother, bought a bus and taught themselves how to sell tickets, rekindles some washed -away bygone recollections. “Few know that he was a great dancer and threw the best parties,” Khanna writes. While the show has been on in full swing, it’s still not clear who would buy the majority 65 per cent stake in the fair from MCH Group, which remains “indefinitely committed” to the event until a new buyer is found. However, this uncertainty does not necessarily spell trouble for the future of IAF. Balancing the importance of promoting Indian artists with the desire to open Indian art up to a global audience, the fair’s director Jagdip Jagpal remains committed to her promise that at least 70 per cent of the participating galleries are South Asian. However, there has been a careful curation of a few stellar galleries from abroad. The talk of the town, however, has been the big debuts including works by Turner Prize winner Wolfgang Tillmans. The David Zwirner gallery that made its debut last year with Japanese conceptual artist Yayoi Kusama, has brought in Tillmans’ extraordinary photographs to Indian audiences. Also debuting was Berlin’s neugerriemschneider gallery, which has brought two artworks by politically subversive artist, Ai Weiwei. Returning for their second consecutive year were the blue-chip galleries Blain Southern and David Zwirner, suggesting continued international faith in the South Asian market. “This year people are more interested and engaged, and it’s showing” says Sascha Weschering, associate director of Blain Southern, which claimed to have sold a thread-on-canvas work, Skin (2016) by Chiaru Shiota, and a copper sculpture, Brother Animals (1993), by Lynda Benglis. According to ArtTactic’s 2019 South Asian Art Market Report, South Asian gallery sales have increased by 9.1 per cent at an estimated $114m, which helps move South Asia from ninth to sixth place in ArtTactic’s global outlook rankings. The report further adds South Asian modern art market has seen a significant growth of 39.7 per cent, far stronger than the growth of its contemporary art market. While works by masters like as M F Husain, Amrita Sher-Gill, F N Souza, S H Raza, Ram Kumar, Nasreen Mohamedi, Satish Gujral, were on display, equal importance has been given to young, upcoming artists. 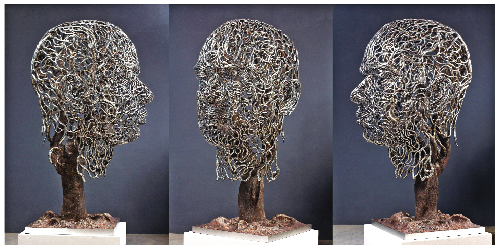 Dhananjay Singh portrayed his theme “you are within me” through his sculptures, intricately twined in bronze, steel and copper wires. As he explains, in the quest for refining his sculptural form he explores new technique and ideas. The theme is inspired by the need for us to question one’s self and draws several paths that traverse through different forms of life. “In this cycle at some point of time we cease to comprehend ourselves in regular interval of conscious-unconscious, day-night, yin-yang, growth-decay and life-death. Each living organism is dependent on another for its survival. It’s a transformation of matter from one into another that happens perpetually. I acknowledge that I am a part of another, and I continue to exist in others even after I lose my body. Thus ‘I am within you’ and ‘you are within me’,” he argues. Another eminent Mumbai based artist Jitish Kallat presented works from his latest series entitled “Palindrome Anagram” paintings. Five large mixed media works on linen explore the intersections of scientific and diagrammatic imageries, deftly combined into puzzle-like combinations that speak of history, geometry, and natural forces. Along with this will be a suite of smaller works, entitled “Emergence,” comprised of watercolors and acrylic on gesso panels. Everyone had something to offer. The National Gallery of Modern Art (NGMA) conducted a night walk through the gallery for the first time, welcoming international delegation from the art fair. A guided tour of its permanent collection included works of Amrita Sher-Gil, Rabindranath Tagore, Raja Ravi Verma, Nandalal Bose, Jamini Roy to name a few. For Adwaita Charan Garanayak, director general NGMA the idea of extending the museum visiting hours and organising special events like “Night at the Museum” has been initiated to increase museum visitation to a larger audience. One could chance upon the special in-house curated exhibitions – Roopantar, an exhibition of sculptures and Dandi Yatra, paying homage to Mahatma Gandhi’s Dandi March. Iconic works by S H Raza, M F Husain, F N Souza and Krishen Khanna represent one of the more critically important segments on the moderns in India. A luminescent Hemen Mazumdar, abstract compositions by Ram Kumar, Shanti Dave, J Swaminathan and Sohan Qadri, an important canvas by K H Ara, tantric-based visualisations by Prabhakar Barwe and G R Santosh, and exceptional works from an important period by Manjit Bawa, Madhvi Parekh, Rabin Mondal and Paritosh Sen made up the rest of the spectrum.DAG also presented a lecture on works of Swiss sculptor, painter, draftsman and printmaker Alberto Giacometti. Many galleries reported strong sales while others refused to divulge details. Kolkata-based Experimenter Gallery for example claimed strong sales at the fair’s preview day itself. It said to have sold works that included a series of small bronze sculptures by Adip Dutta, Sites for Excavations (2019), and an oil-on-canvas by Ayesha Sultana, Untitled (2019). Prices at the stand range from around £1,500-£38,000.